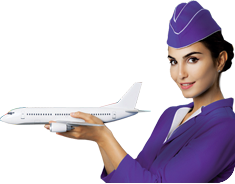 This course prepares you for a range of job roles in airports, airlines and hotels. With the exceptional growth in the number of tourists visiting India every year, a qualified professional has huge employment opportunities. By 2028, there will be over 3.3 crore jobs in the travel and tourism industry. ** This includes employment by hotels, airlines, travel companies and other passenger transportation services. With Aptech Certified Professional in Ground Staff and Hospitality, you can prepare for a range of in-demand careers. With Aptech Certified Professional in Ground Staff and Hospitality course, you will develop an understanding of various aspects of the aviation industry, as well as build a strong foundation on the principles governing aviation, passenger and baggage handling.